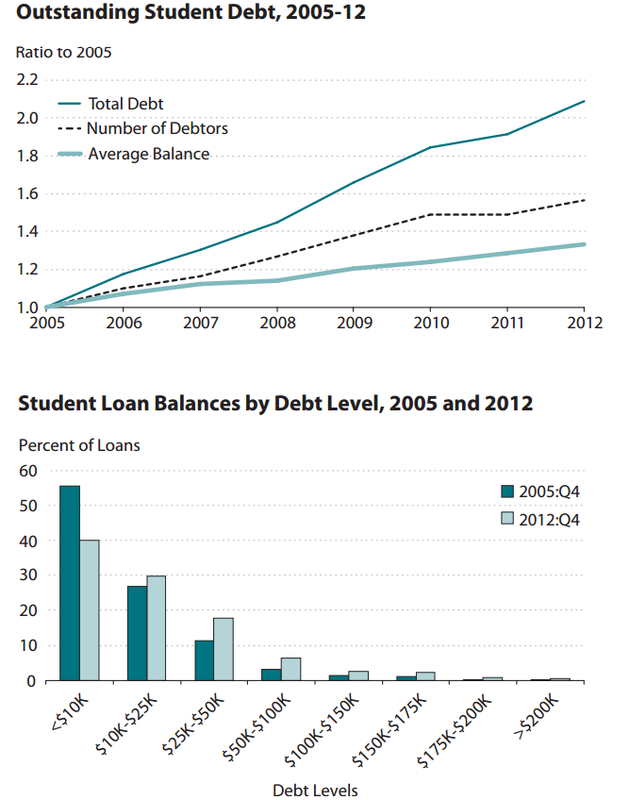 It’s not just the total number of student loan borrowers that is going up. The average balance per borrower is going up as well. The St. Louis Fed last month had a blog post that showed that as of March 2012, student loan debt stood at $870 billion and had surpassed total credit card debt ($693 billion) and total auto loan debt ($730 billion). What’s staggering is the rapid growth in the last seven years in the amount of debt that is being accumulated by the average student. How will this impact this generations’ ability to buy a home or car as they are now behind the eight ball right out of the gate? In addition, the rise in student loan debt has been accompanied by a rise in default rates, which stand at 13.4 percent and 14.7 percent for students entering repayment in 2009 and 2010. This will also cause some major problems if students don’t earn a degree (students dropping out before graduation) and find success in the labor market (that is, finding jobs that pay well enough to justify the investment). We wrote a piece a few years ago about one of the main problems in our opinion…decreased funding of higher education from state government. Hear is the link to that post: College Tuition… Will Increases Slow Down? Runaway debt is very bad… let’s hope our country can address and learn from our recent lesson in 2008 that stung pretty bad.